The Security 4.0 architecture is the foundation of what sets BluBØX apart and ahead of the rest of the Physical Security industry. See for yourself how the key elements of Security 4.0 combine to create capabilities that can never be achieved with client-server architecture. Move ahead on solid footing with BluBØX and Security 4.0 architecture. All servers, PCs, software, storage and redundancy that is normally purchased and installed locally as part of a security system is now provided and maintained at a fraction of the cost in the BluBØX Cloud. The risky and inconvenient client-server software and firmware upgrades are now performed automatic and seamless by the BluBØX Cloud. before access, collaboration and efficiency regardless of the solution. BluBØX Artificial Intelligence is split between the BluBØX Local system and the BluBØX Cloud. BluBØX Local provides local decision making such as deciding a person’s identity, opening a door, sounding an alarm or recording a video event. All events and metadata are sent to the BluBØX Cloud where high-level artificial intelligence is utilized using unlimited computer processing and Big Data analytics. The resulting analytics and situational awareness is distributed where needed, available through the BluSKY interface and sent back down to the local systems to enhance local system intelligence. BluBØX True Mobile Security architecture is an enabling technology that provides never-seen-before mobile security capabilities. Because you cannot predict when a security issue might arise, BluBØX True Mobile Security provides cellular or Wifi connectivity to the BluBØX Cloud and BluBØX Local system from any device, anywhere, any time. BluSKY software is browser and operating system independent. It is Web-Cloud software so there is no software to install or maintain and it provides 100% system functionality no matter what device it’s used on.The BluSKY interface also adjusts to the mobile device being used to guarantee a smooth user-experience all the time. All BluBØX systems connect to the Cloud via standard Internet. The BluBØX Local system plugs into the customer’s IP infrastructure so there are no special infrastructure requirements. All communications between BluBØX Local and BluBØX Cloud is initiated by local outbound communication in line with Best Security practices. between BluBØX Local and Cloud. BluBØX Unified provides all major security functions built from the ground up as one set of unified Web-Cloud applications sharing one database, one user interface and many core components. Event data is shared across all applications forming macro events that are displayed on BluSKY’s unified application interface. BluBØX Unified architecture also provides a common clock such that all events from all systems are always synchronized. Unlike local client-server software, BluSKY’s Web-Cloud applications extend to everywhere, on any device, giving you the power of BluBØX Unified no matter where you are. 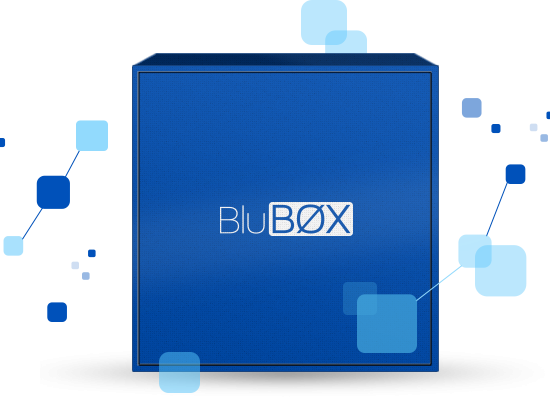 BluBØX with Mercury inside is just one of many tried and true open standards we use to ensure BluBØX customers never get locked into one brand or proprietary hardware. Our Freedom of Choice architecture enables our customers to pivot at any time and move forward in a different direction. BluBØX systems are all IP based and video is Onvif compatible. BluSKY’s Open API uses a Service Oriented Architecture (SOA) to ensure that it can connect to everything. BluBØX Open Standards architecture ensures we can easily upgrade legacy systems, remain backward compatible and future proof all at the same time. Processors and memory are so inexpensive, small and powerful now that cameras have become recording appliances also. BluBØX stores video footage locally on each camera and uses analytics to eliminate useless footage and maximize retention. Video footage from each camera is also sent to a local video processor where it is redundantly stored and additional analytics further reduce content down to the most critical video footage. Footage from the video processors is transmitted to the BluBØX Cloud for long-term storage and review. Live or archived video footage from any camera or group of cameras can be viewed locally or remotely with BluSKY. The BluBØX Person Reader can be installed anywhere you would use traditional access control. It interfaces to BluBØX Local hardware via Weigand and is seen as a reader on the system. The Person Reader also connects to the BluBØX Cloud via Ethernet cable or wireless to receive database updates, send back events, update its software and provide health and status monitoring. The Person Reader database is stored locally and decision making and self-learning is done at the Person Reader. Using BluSKY, people can enroll centrally or at any reader in the system. The database and all event data are sent back to the BluBØX Cloud for reporting and further processing. All traditional security devices can connect to BluBØX because we use open industry standards that ensure compatibility. This makes conversion to BluBØX very simple and cost-effective. Upgrading to BluBØX architecture breathes new life into a tired system. With BluSKY you can control and monitor any portal or point anywhere, from any device. You can use your phone to unlock the door or as an alarm keypad. Traditional security devices are given new life and new functionality with BluBØX technology.